I have written many, many times about my love for guided math. Small group math was one of my most favorite times of the day. Breaking the kids into smaller groups allowed me to really watch and learn how individual students problem solved. 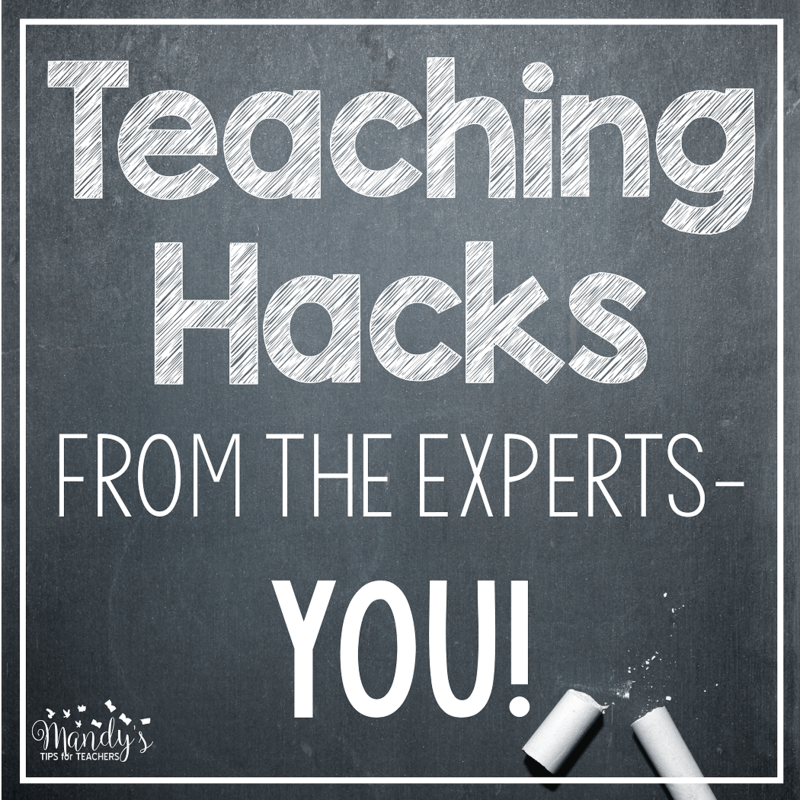 It made it so much easier to pinpoint errors and also really advance students as needed. What did I NOT love? Sure I loved the CONCEPT of centers. They are FUN. Kids can work in partners and move around the room. They could really discuss math. Except, they were a hot mess. With movement, comes the mess. The itty bitty pieces everywhere. And the explaining of directions. Oh my. Just having to explain WHAT to do in centers each week was tough. And re-explaining when kids inevitably forgot, because they are kids. That and making copies. Oh, and then how to STORE all these centers I worked so hard to create? Ekk! It was just HARD. Was it worth it? In my mind, YES. It was all worth it so I could have small group time. However, that doesn’t change that fact that it was a challenge. What if I told you I could make it easier? I have been working with my daughter’s first grade teacher. I have been creating a few things here and there for her. 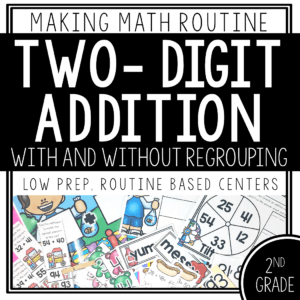 One request she had was easy prep and fun math centers. That was her one request. I sat on a few days and thought about it. I really wanted centers that could be low prep and ease the struggles I had. That is when I came up with Making Math Routine Centers. I will be completely honest, the idea is not brand new. I am sure someone out there has come up with it before. However, I hope my approach is new- at least it was new to ME! 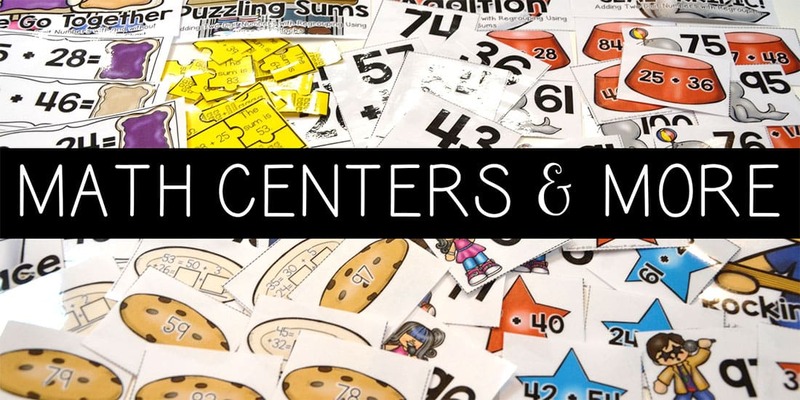 How are these centers different? Teach students how to complete the center ONE time, and they can apply that game format to many, many skills. However, just in case students forget, an “I Can” card with directions is provided for each center. 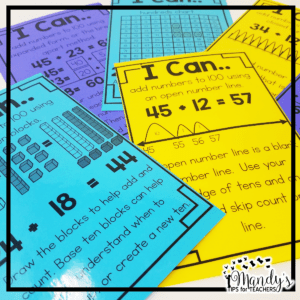 For the adding two digits with and without regrouping pack, “I Can” cards modeling different strategies for addition (base ten blocks, number line, hundreds chart, etc) are also included. 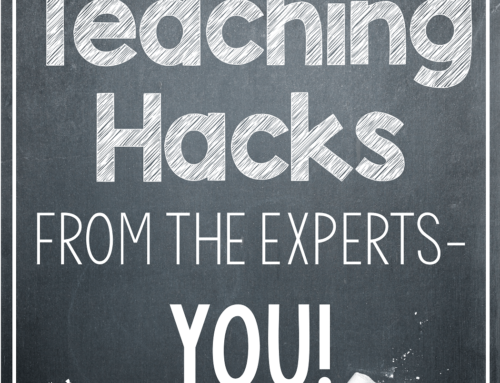 How can I reach more learners? 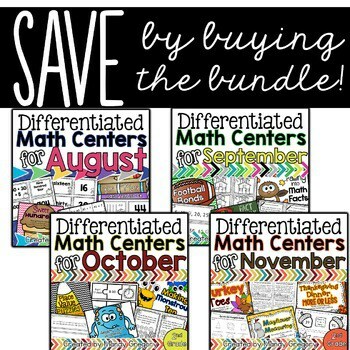 I also wanted to embed natural differentiation in the centers to reach more students. The teachers can introduce these to more advanced students for differentiation, or just when students are ready to tackle the next concept. 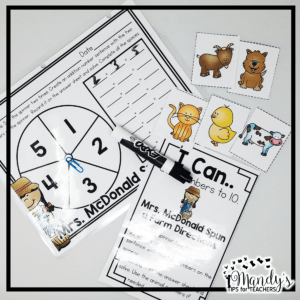 For example, this pack has activities with adding to 10. 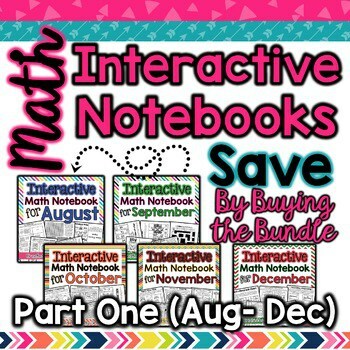 There is an additional set of activities for adding to 20. The same goes for my addition to 100 set. One set of centers contains regrouping and another does not. What about all the pieces and copies? 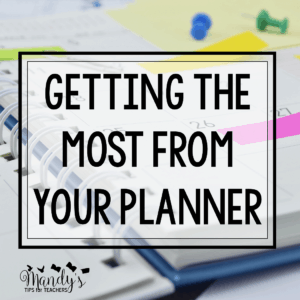 I tried really hard to make these centers easy prep for the teacher and manageable for students. Many of the centers (such as the die and spinner) can be laminated and reused many times to reduce copies. 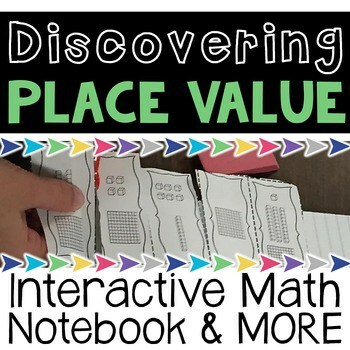 Students can use small white boards to show their work. 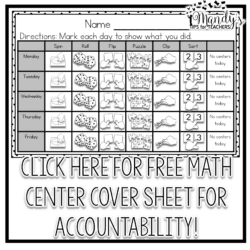 I did include recording sheets if teachers would like to include this bit of accountability. The centers easily store in zip lock bags. The bags can be stored in baskets or in the Sterlite letter size drawers. Here are FREE abels for both the baskets and/ or the drawers. 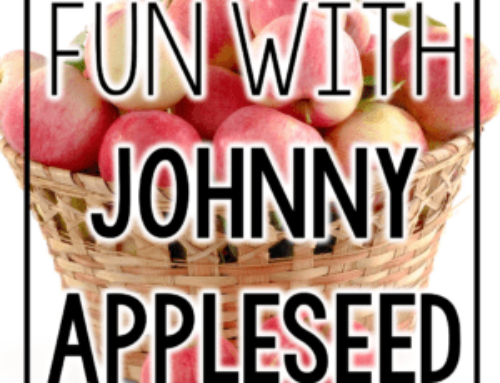 The square pictures could label baskets or also be used as center icons on a rotation board. 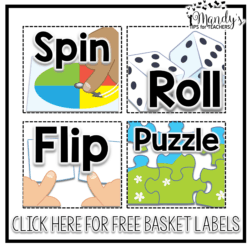 Since the type of centers will remain consistent, these labels can last all year, just replace the centers! 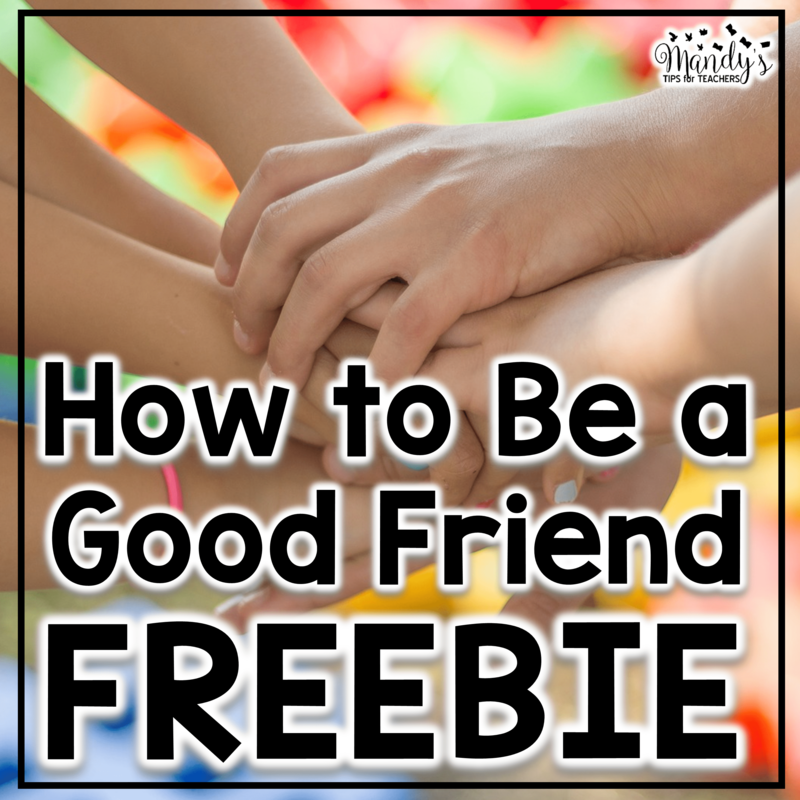 Just click on the picture to grab the free file! Now that I love them, how do I STORE them? That was the other piece I really considered. I wanted my daughter’s teacher to be easily be able to store them and use them year after year. Here is what I came up with. 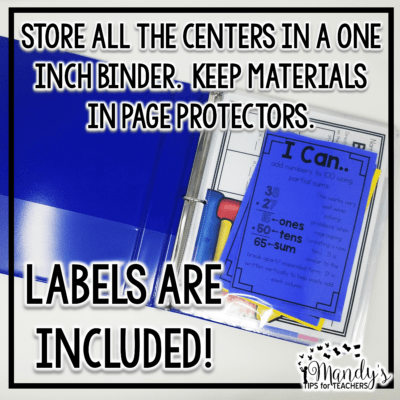 All the centers from each pack can fit in a 1” binder. Print, laminate and cut out the center. Place any lose pieces in baggies (I fit almost all the pieces in sandwich size baggies, except for the clothespin cards. I used a quart size baggie for those). I put all the pieces, “I Can” card, and any master copies in a page protector. 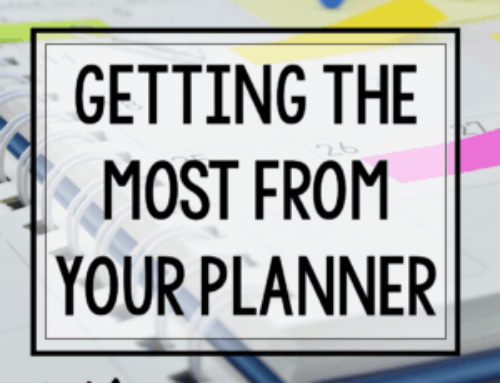 If I laminated a page, I simply hole-punched it to place in the binder. Labels are provided for every centers. 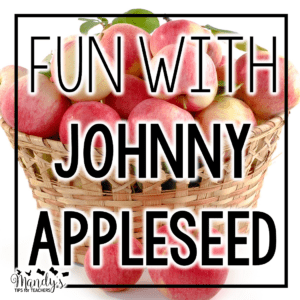 The labels are 2×4 inch shipping labels and contain the center name, skill, common core standard addressed, and materials needed for the center. The cover is perfect binder cover and a “table of contents” is included for the back of the binder. This table of contents lists each game and the materials needed for each type of center. Everything is at your fingertips! If you are looking for some kind of contract or recording sheet to keep students accountable, I created this simple, half sheet contract. Students can circle or color in the center they completed each day. 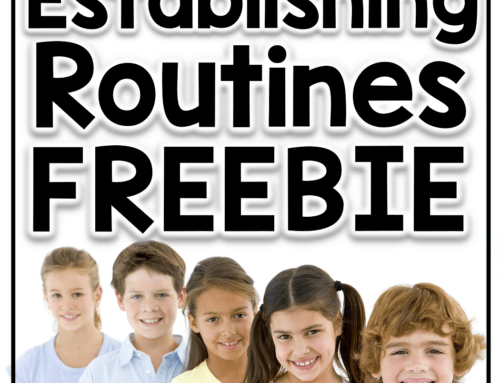 You can grab it FREE by just clicking on the picture. Very few materials are needed to implement the centers. I will link some from Amazon, just in case, so they are in one place. Please note that these are affiliate links, so I may receive a small commission from any purchases! Thank you for your support. The one tool I LOVE is the spinners. 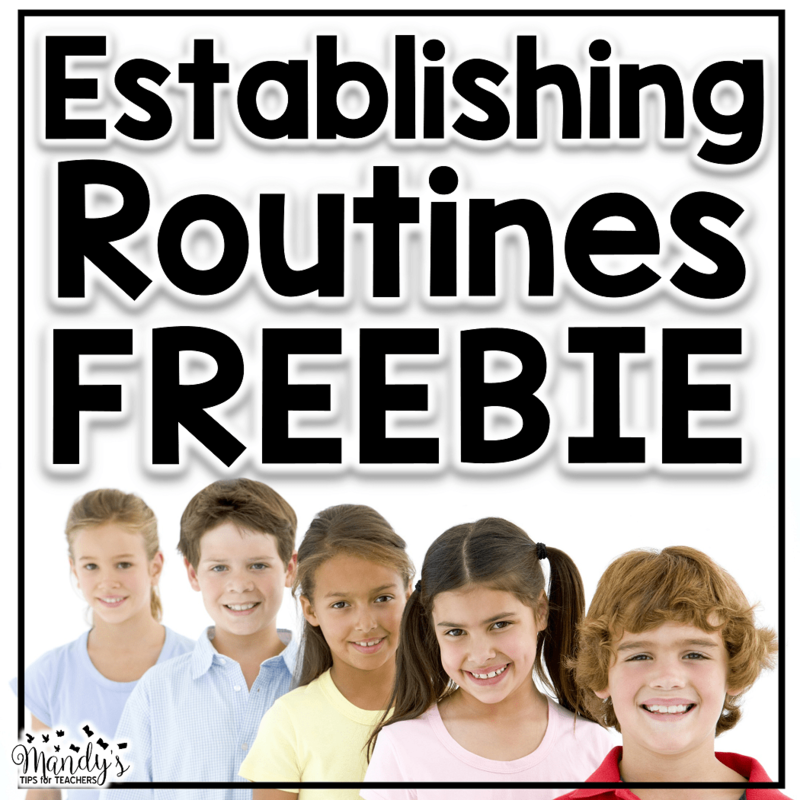 They are a bit pricey, but make spinner activities SO MUCH easier! No more messing with brads and paper clips! 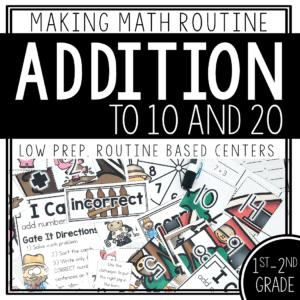 Keep math centers SIMPLE with these easy prep math centers for adding to 10 and 20. 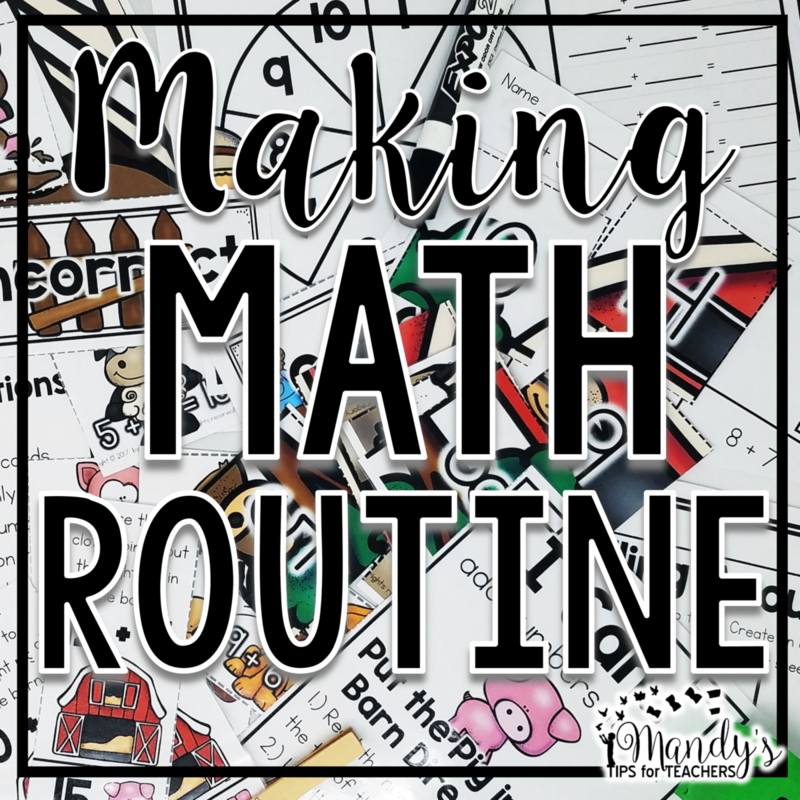 Students will follow these math routines to practice different math skills! Teach once- play all year! Does this look perfect for you? Click below to grab both sets!